Out last day in Baker City we decided to do the drive to the Hell's Canyon Viewpoint around 70 miles.It was a nice drive on Hwy 86 turning off on NF road to the viewpoint around 22 miles. 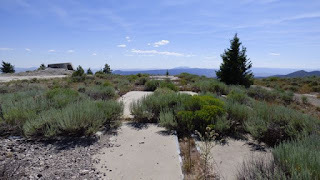 Fortunately it was a paved road. The viewpoint afforded nice views of the canyon, but must say I was disappointed in that I expected a view of the Snake River as well. 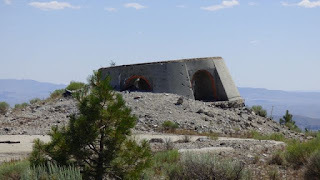 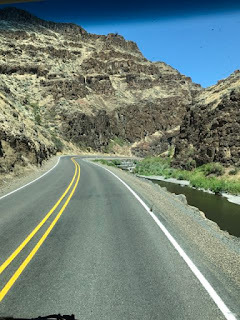 Tomorrow we leave for family in Redmond, OR driving Hwy 7 to 26 through Whitman/Wallowa NF, John Day and Fossil Beds, Prineville and into Redmond. Drive as nice, but mostly 2 lane and winding. 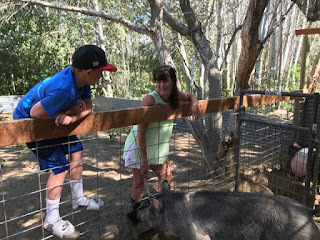 It sure is good to be back with Hope, Shawn and grandsons Colt and Cade. 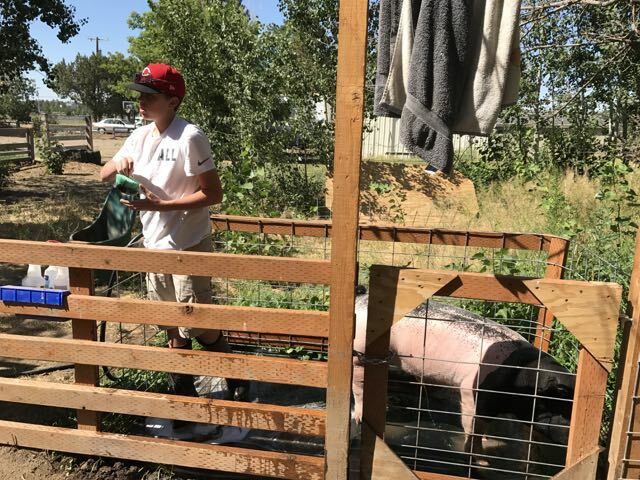 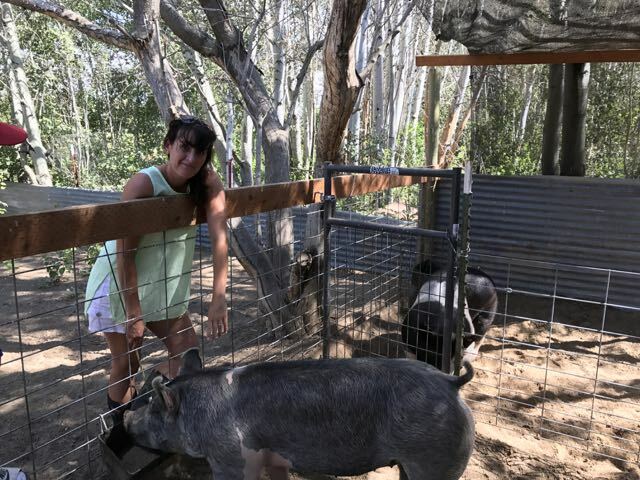 Lots of activities going on getting ready for the Deschutes County Fair and the boys showing their pigs. This is Colt's 4th year and Cade's 2nd. 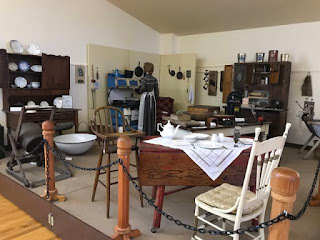 John and I have been busy sorting out the few boxes of personal things and scaling down to only 4 boxes each. Someday the children after we are gone, can sort through and keep what they want and discard the rest. 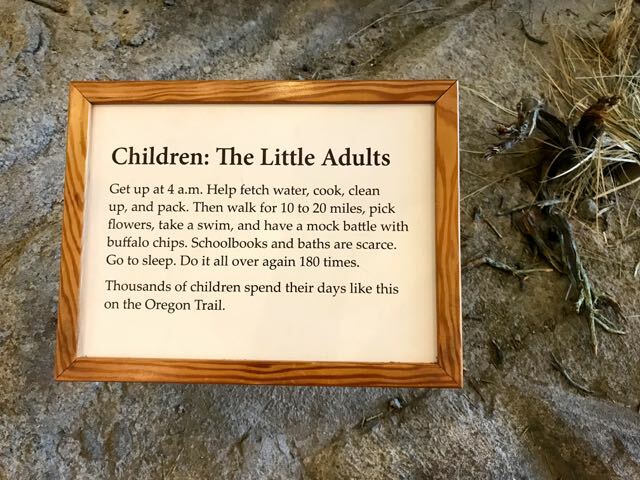 Most important items are pictures. 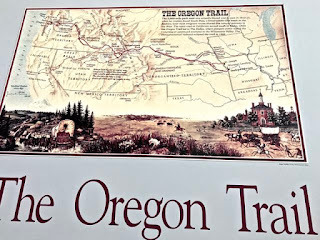 We will be here until the 10th of August, then over to Salem for 2 nights to visit friends before spending a few nights at the coast. 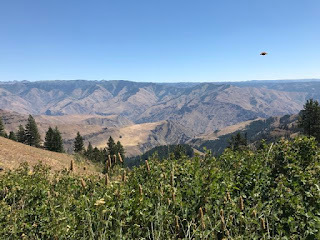 Hope and family were supposed to go with us, but job and the deluge of people coming into the area for the Solar Eclipse cancelled their plans. 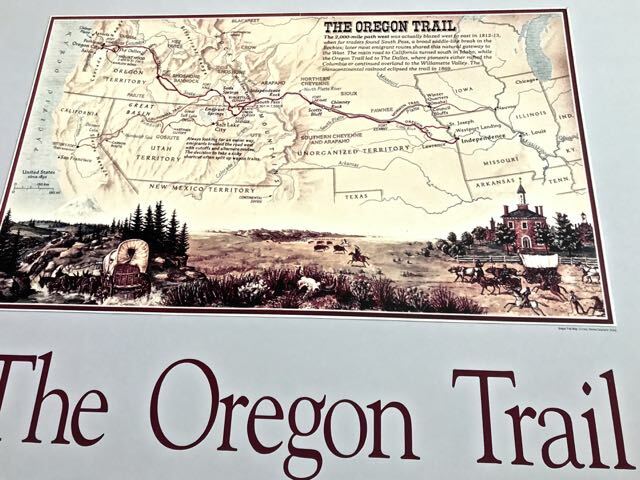 As for us we are not too excited about this and will be in Junction City in southern Oregon. 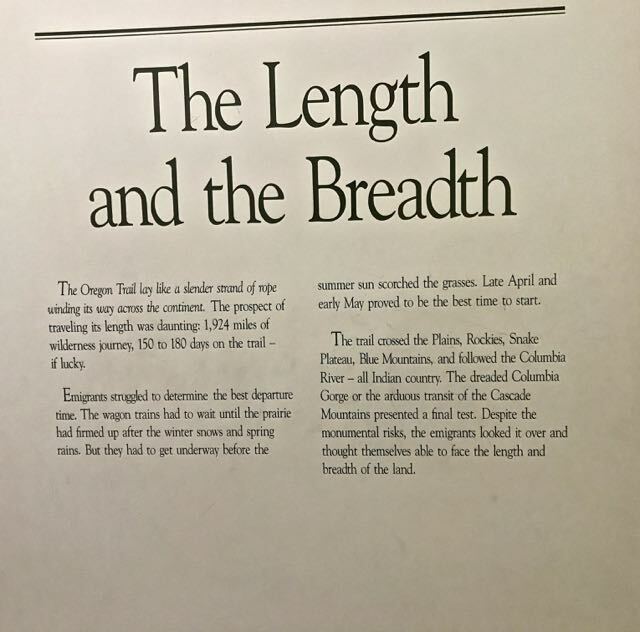 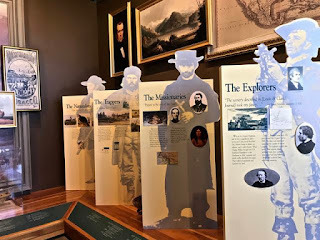 The Oregon Trail Interpretive Center located 5 miles from Baker City on Hwy 86 it a must if in the area. 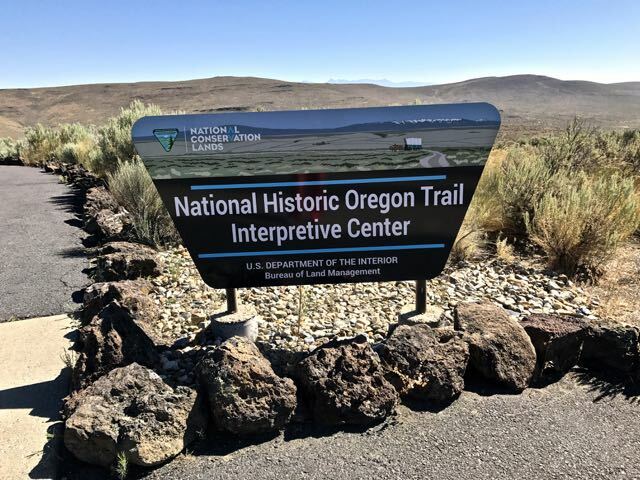 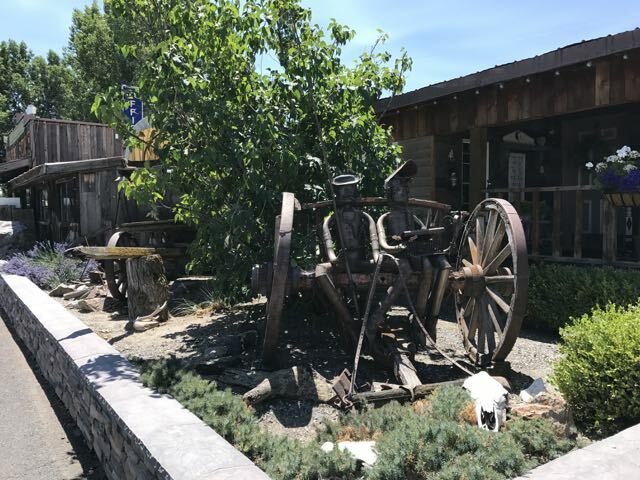 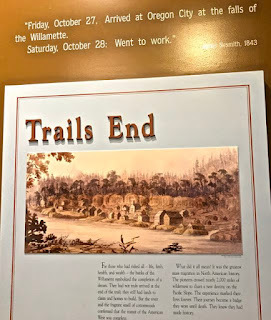 It not only houses exhibits on the history of the Oregon Trail, but also has 4 miles of interpretive trails. It has been estimated that some 296,000 traveled to Oregon,California and Utah from 1840 to 1860. 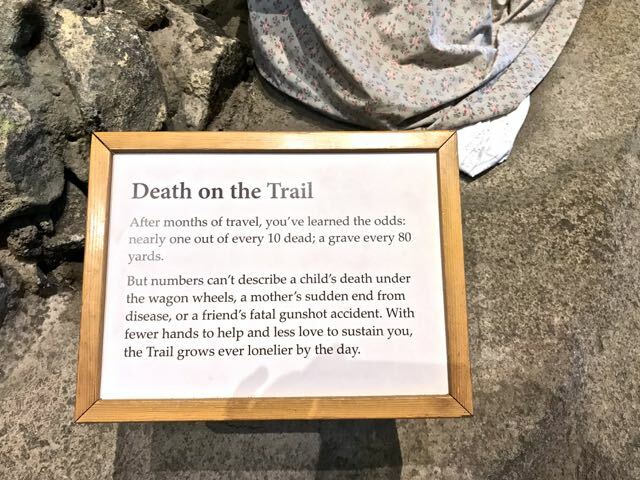 Some estimates put the number at 500,000. 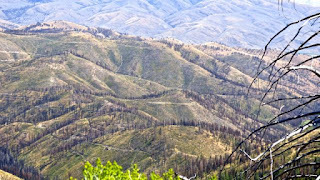 It is estimated that perhaps 10% died en route from variou diseases, dehydration, accidents, drowings, attacks and accidental shootings. 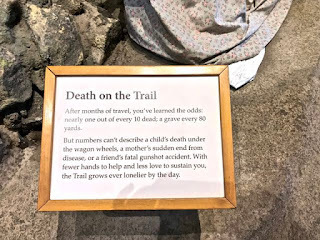 Burials were hasty in primitive graves wrapped in just cloth or blanket in unmarked graves to deter grave robbers. The journey was 2,000 miles made by settlers seeking a better life, seeking fortune and land claims and the lure of gold. 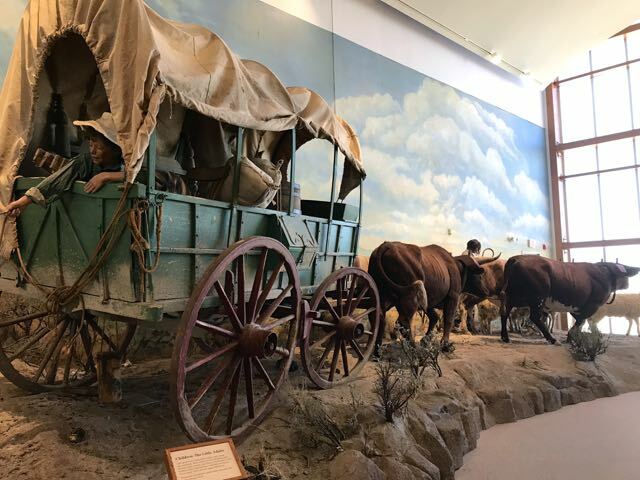 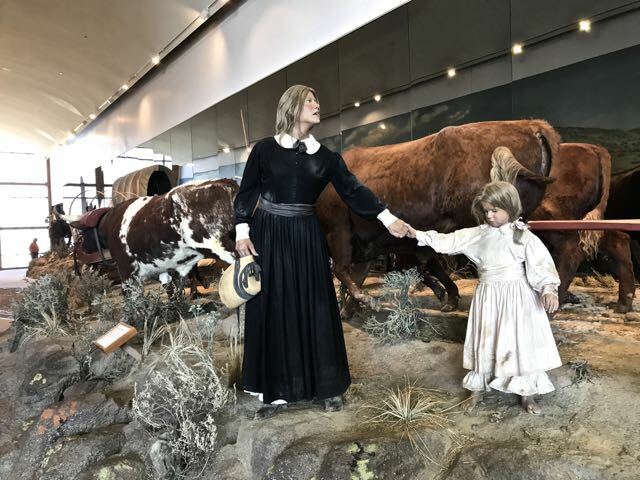 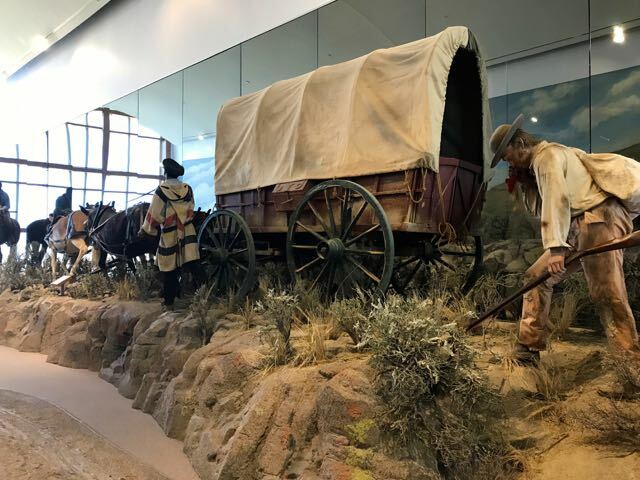 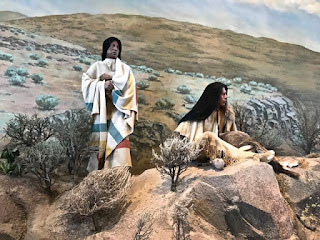 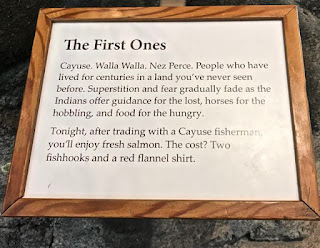 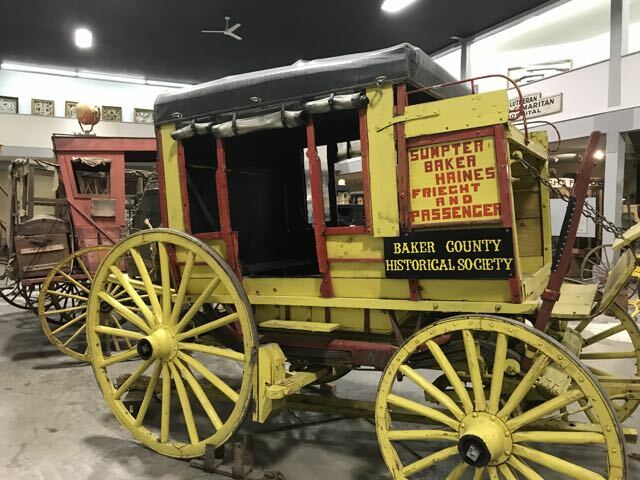 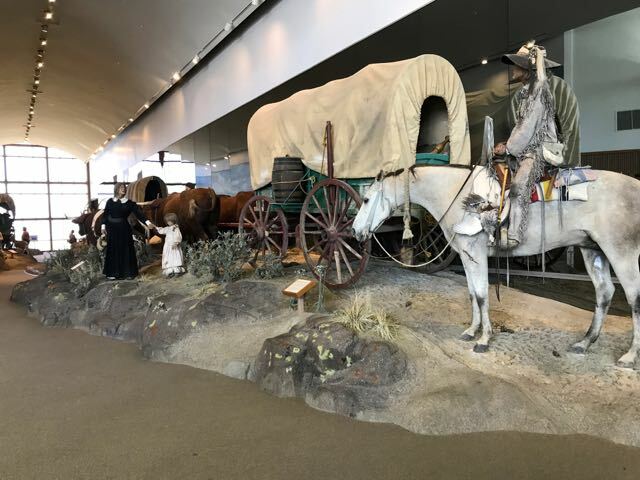 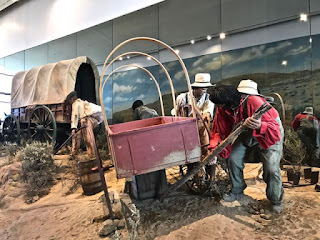 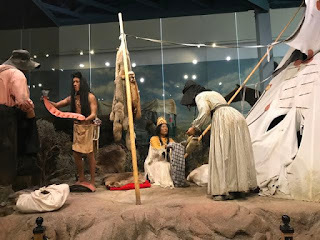 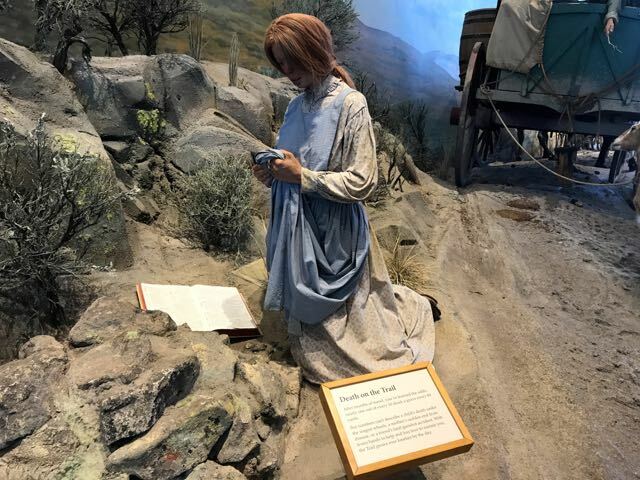 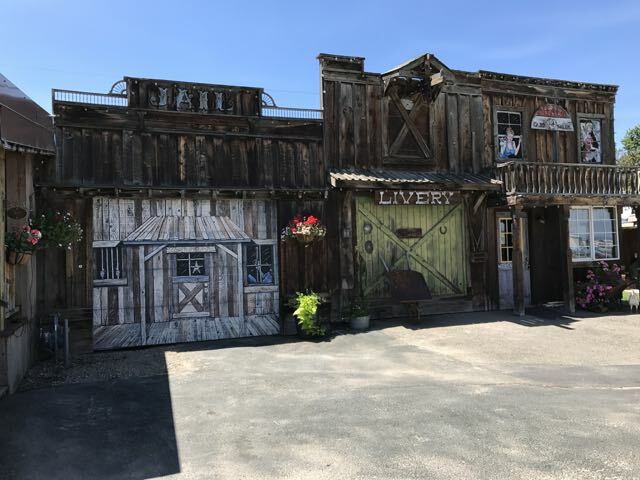 The Center features 12,000 square feet of galleries with life size dioramas, replicas of the wagons and artifacts.Signage takes you through the journey,life on the trail and interaction between the emigrants and Native Americans. 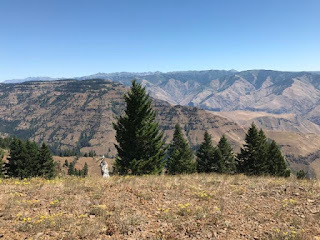 The views of the Wallowa Mountains are magnificent. 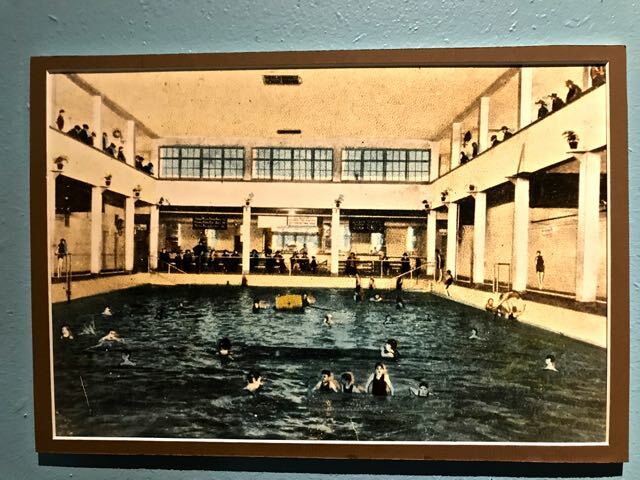 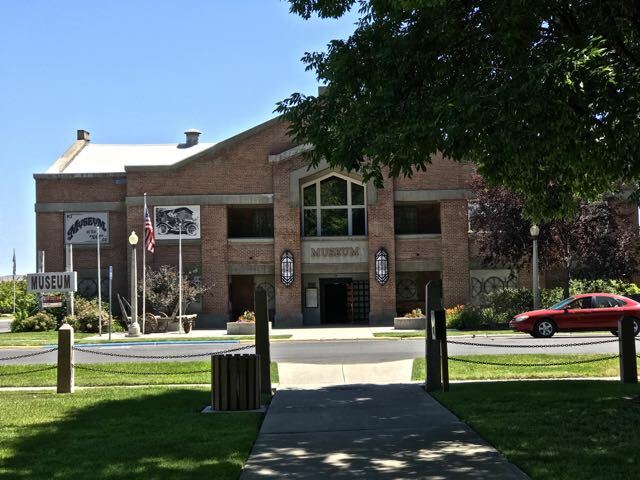 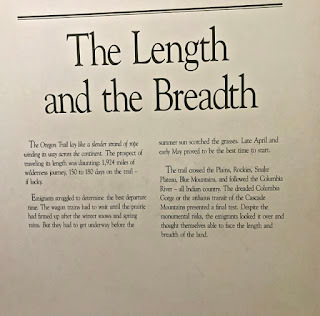 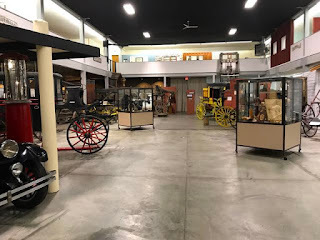 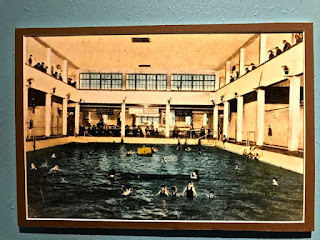 The Baker City History Museum is housed in the former 1920 Natatorium and features many exhibits on the history of this area including mining, timber,ranching, agriculture, early Baker City life, Chinese culture and wildlife in the 33,000 square foot building. 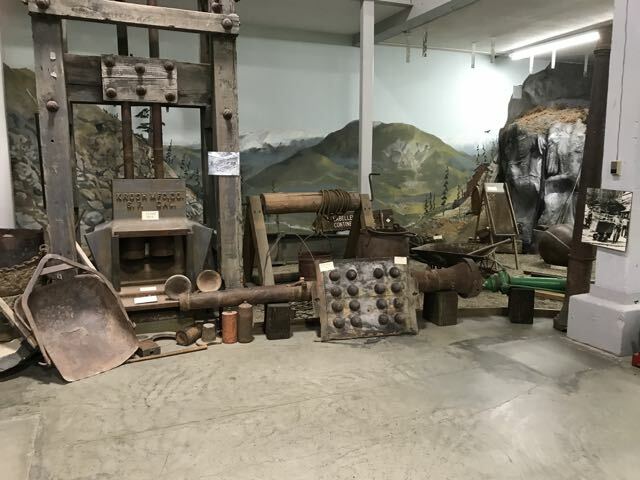 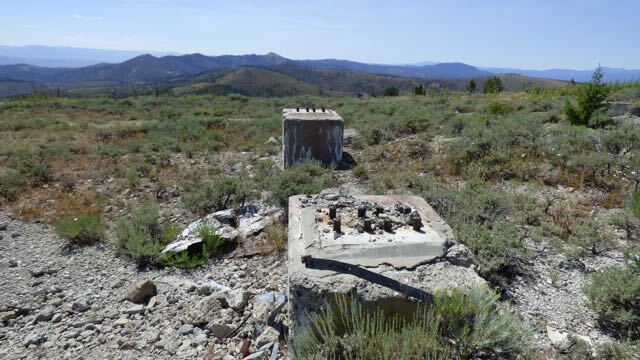 Baker City was the top gold mining area in Oregon with over 513 mines yielding over $3 million in gold. 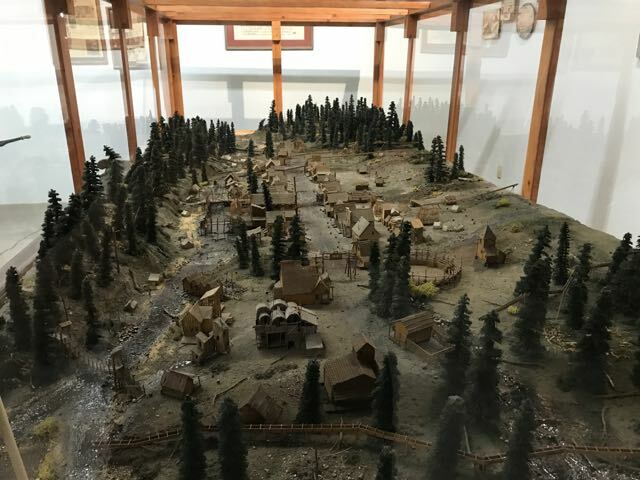 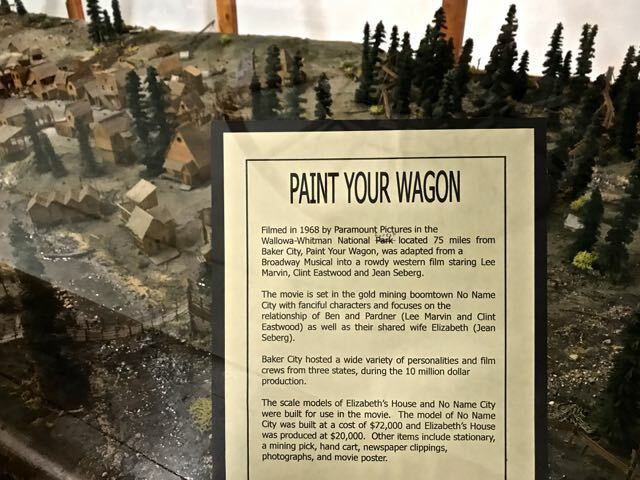 One of the exhibits features the miniature set used for the movie "Paint Your Wagon" filmed here in 1968. 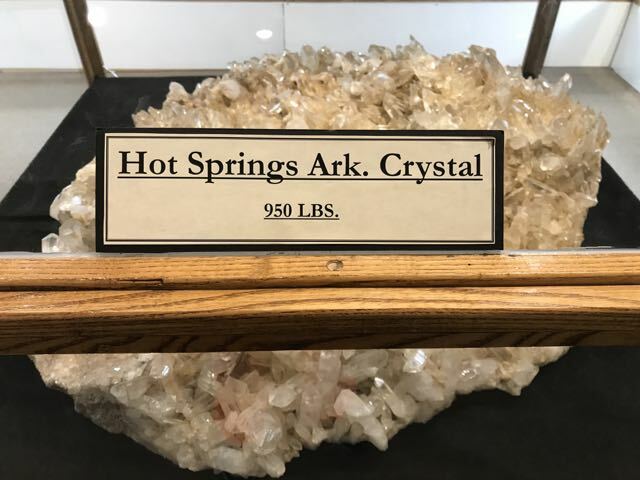 A huge collection of rocks, fossils,agates and minerals is featured. This is also a museum worth visiting. 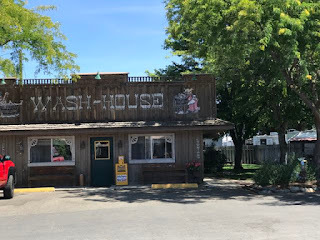 Our drive today took us on IH 84 from Mountain Home,ID to Baker City,OR. Landscaping is brown and arid somewhat like California. 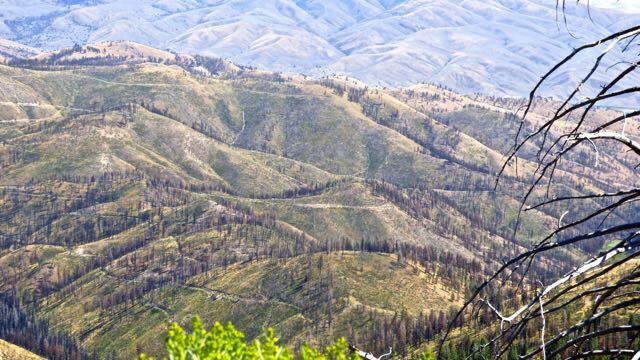 Seems rain would be a welcome relief here. 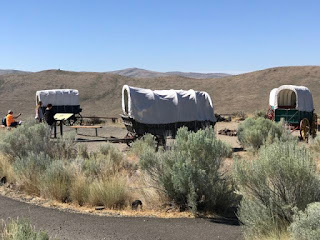 Mountain View RV park is very nice with rustic buildings depicting history long ago of settlers. 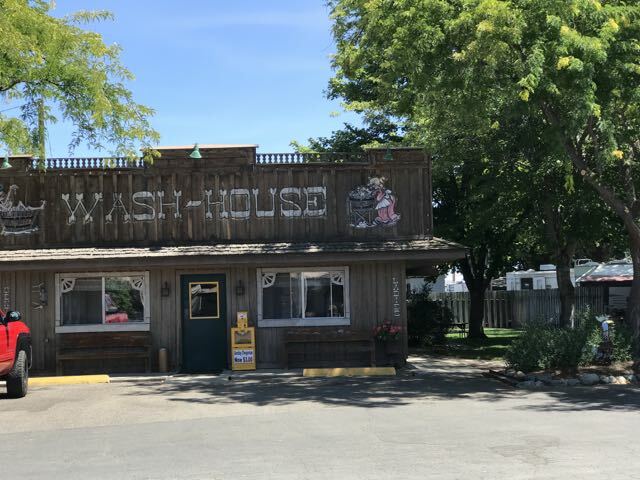 Staff very friendly and helpful.We are in site 95, pull thru with full hookups and 30 amp. 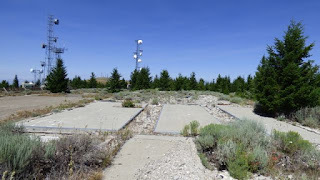 Wi-Fi is good and sign in is last name. 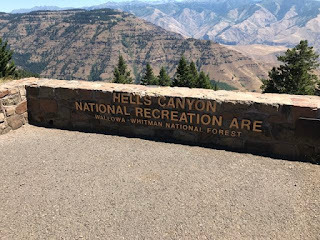 The park is full. 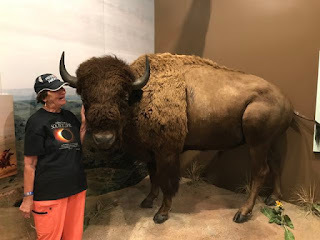 Bought a Solar Eclipse t-shirt. Guess this area will also be inundated with Solar watchers on the 21st of August. 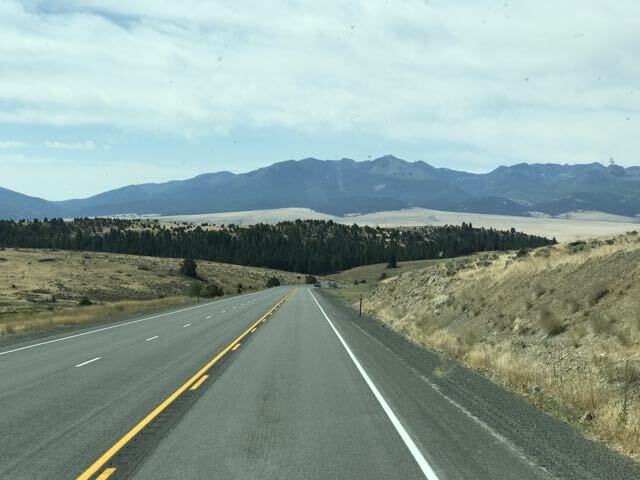 We will be in Junction City, so will probably miss the full effect. 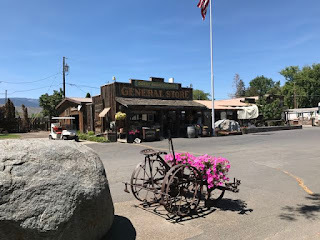 Returning back to Baker City, stopped at Safeway for some items. We were originally planning to stay 4 nights, but decided 3 was sufficient. 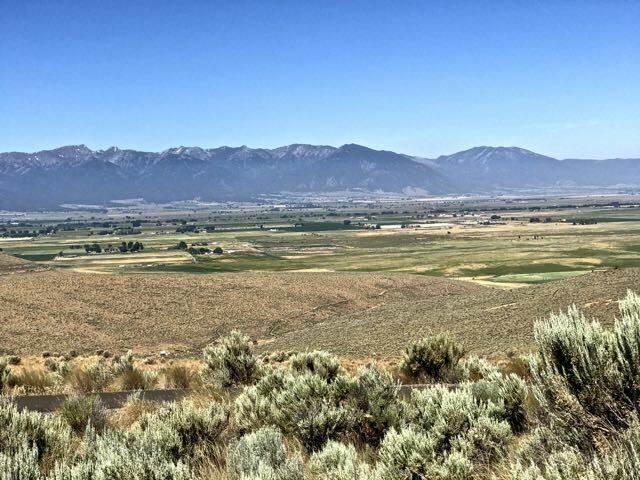 Baker City is named after Edward D Baker, the only US Senator killed in military combat during the Civil War in 1861. 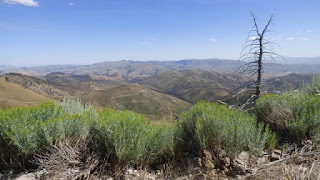 In the 2010 census,the population was 10,000. 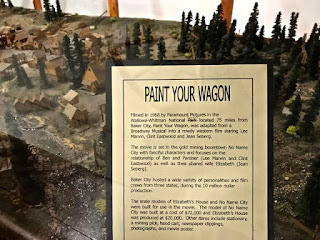 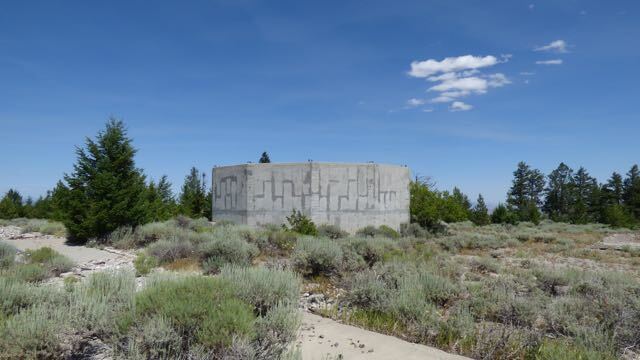 The town was incorporated in 1874 and is situated between the Wallowa Mtns and Elkhorn Mtns. The Powder River runs through town on the way to the Snake River. 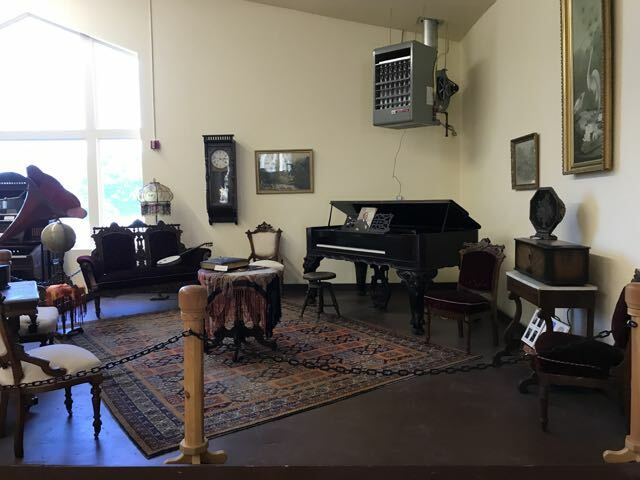 There are several museums, historic homes and the Geiser Grand Hotel built in 1889-since restored. 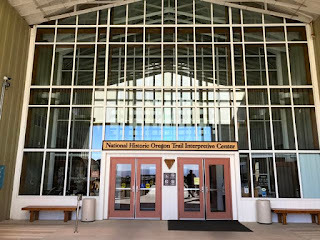 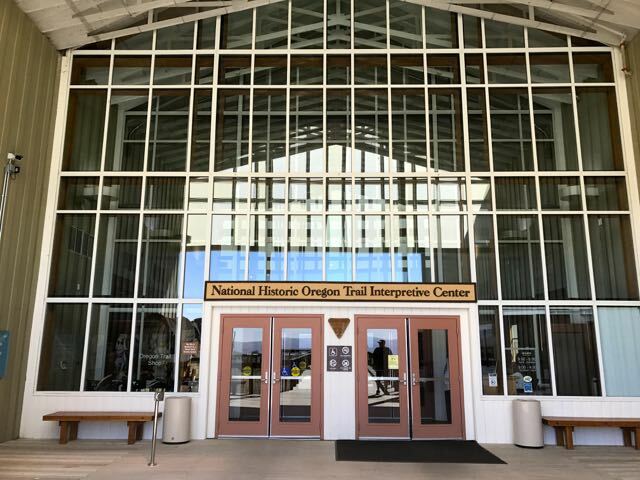 Nearby is the Oregon Trail Interpretive Center. This is my first visit here. Tomorrow we are going to the History Museum and Oregon Trail Interpretive Center. 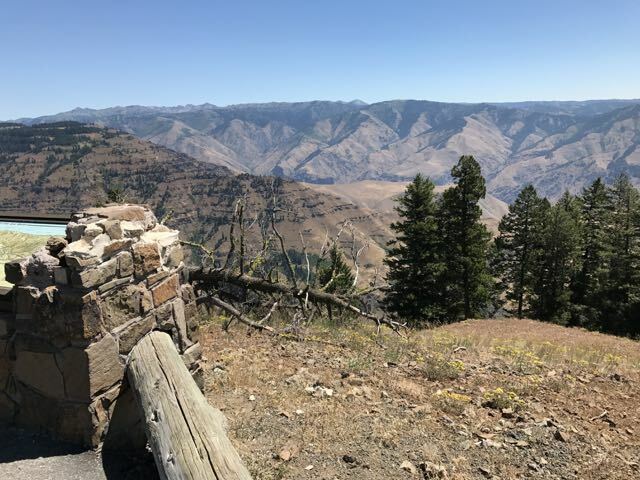 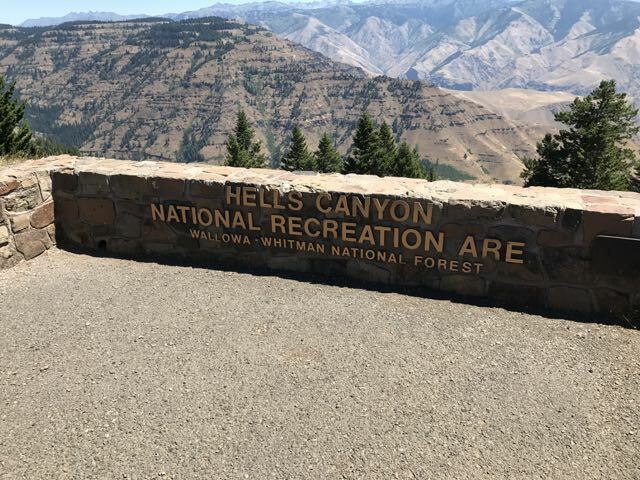 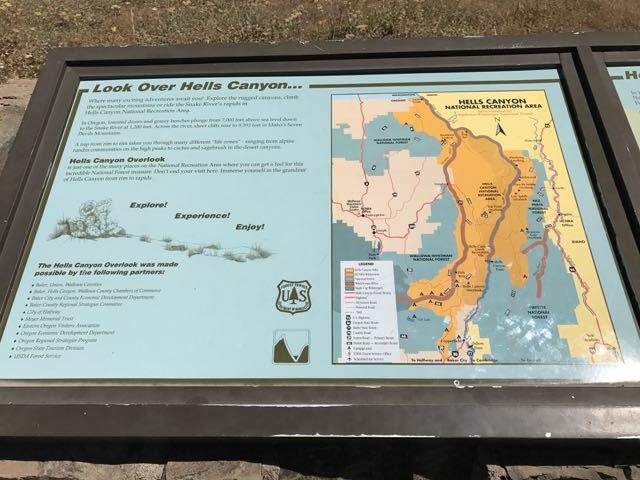 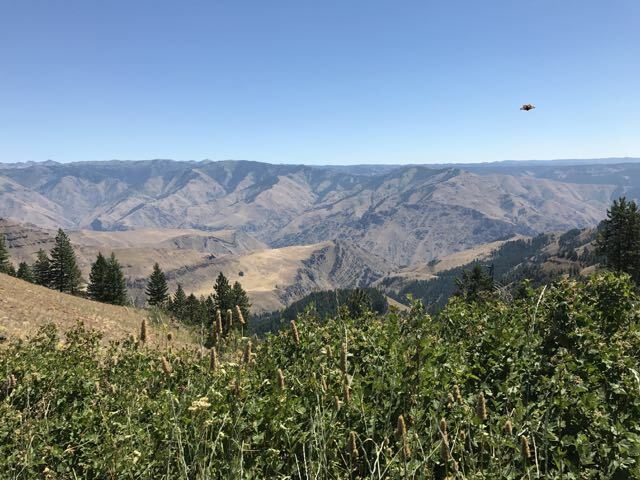 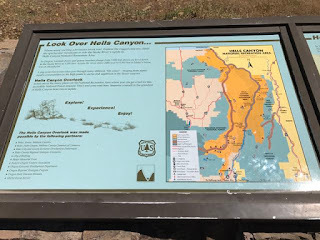 On Sunday a drive to Hell's Canyon south area view point.